Nourish skin with the Moisturizing Home Spa Massage Cream from PUPA. The rich, velvet-smooth formula effortlessly melts into skin, perfect for an indulgent massage with aromatherapy benefits. Infused with emollient-rich White Lily extract, it cocoons skin in a soft veil of familiarity and comfort, imbued with the subtly spiced note of Natural Clove Oil. Skin feels hydrated, smooth and sumptuously supple while the mind succumbs to a sense of wellbeing and relaxation. 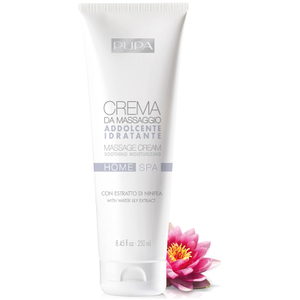 Apply the massage cream after bath or shower. Massage all over the body with circular motions, and particularly on those areas where the skin seems to be drier and dehydrated. Let the skin absorb the product for a few minutes before getting dressed.